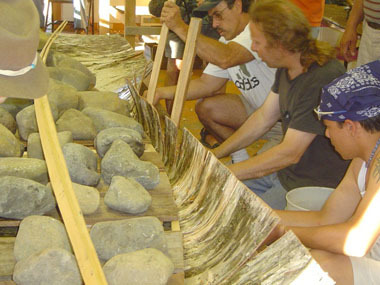 Beginning in 1996 I taught a series of intensive one-week classes at the WoodenBoat School in Brooklin Maine, and in each a group of about 10 students completed a 14-foot birchbark canoe with my help. 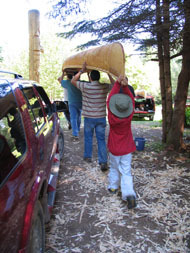 Each canoe went home with one of the students, selected by a drawing, who paid for the materials. This was my first experience teaching birchbark canoe building, and I think I learned as much or more than my students. My thanks to Rollin Thurlow, proprietor of the Northwoods Canoe Company, for his referral, and to Rich Hilsinger for getting me started. In 2002 Barry Dana, then chief of the Penobscot Nation, asked me to lead a birchbark canoe workshop on Indian Island, the Penobscot reservation in Old Town, Maine. He knew that the key to making this project a success would be to enlist the support of his uncle, Penobscot elder Butch Phillips. Butch was already an accomplished birchbark artist who made beautiful model canoes and moose calls, out of winter bark etched with traditional Penobscot artwork. 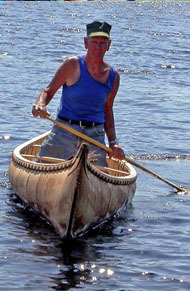 Butch shared the typical Penobscot streak of independence, and he needed no teacher, much less a non-native, to learn birchbark canoe building. But when Barry suggested they could paddle the canoe up the Penobscot River to Mount Katahdin, as part of the tribe’s annual pilgrimage to their sacred mountain… he was in. And it was Butch who was the driving force behind the building of that 18-foot canoe, always there, keeping us on tasking, and keeping us entertained with his stories. The canoe was finished, and paddled in shifts on the “Katahdin 100.” Butch then went on to build another canoe on his own. The beauty of that birchbark canoe workshop on Indian Island, and of others there that followed, was that it took place in the middle of the reservation, where everyone could stop by to visit. In this way a culturally significant effort, that of reviving a traditional craft long dormant, was supported by the entire community. Starting with their participation in the Indian Island canoe workshops, Wayne Brooks of the Maliseet First Nation at St Marys in Fredericton, New Brunswick, along with his son Cody Brooks, got involved with birchbark canoe building at every opportunity. 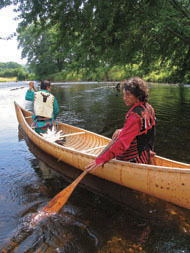 Eventually Wayne and his family hosted two canoe workshops in their own community, one at the Wolastokwiyik Nawicowok Sacred Lands Trust in 2004, and the other at their home at St. Marys. The second of these, which took place in 2009, involved the building of a full-scale reproduction of a historic 21-foot Maliseet birchbark canoe which had been brought to Galway, Ireland in 1825, and returned to Canada in 2007 for conservation. This old canoe, the oldest known Maliseet canoe in existence, was given the name Grandfather Canoe. Through the work of Wayne and his wife Kim Brooks, It was repatriated to the Maliseet First Nation by the people of Ireland in 2009. 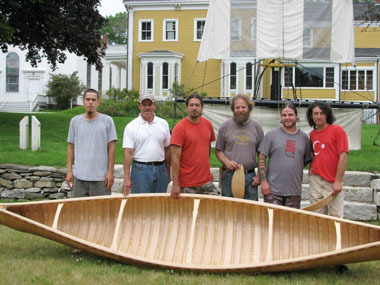 Also in 2009, the Penobscot Marine Museum in Searsport, Maine hosted a birchbark canoe-building workshop, in which a group of Penobscot, Passamaquoddy, and Maliseet birchbark canoe builders built a 16-foot birchbark canoe on museum grounds with my help. This provided an opportunity not only for further building experience for the participants, but also for museum guests to learn about traditional Wabanaki culture firsthand. The PMM plans to host birchbark canoe workshops again. My thanks go to Passamaquoddy birchbark artist and canoe builder David Moses Bridges (right) for his teaching help on most of the Wabanaki workshops, and with the WoodenBoat School classes as well. I also want to thank the sponsors of our birchbark canoe workshops, which include the Maine Arts Commission, the National Park Service, and the Canada Council for the Arts. The canoe projects in the native communities typically involve from about 6 to 12 participants in the building of an 18-foot birchbark canoe, which the tribe or host organization then keeps. 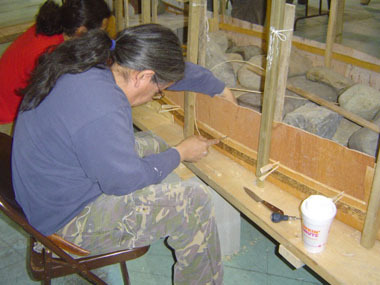 Usually tools such as the traditional crooked knives are supplied, to equip participants for further projects. I look forward to leading further birchbark canoe workshops, among both native and non-native groups. We now have plenty of indoor shop space here in Wellington, and some guest accomodations, and are currently exploring the possibility of hosting canoe classes here, and also of taking on apprentices.